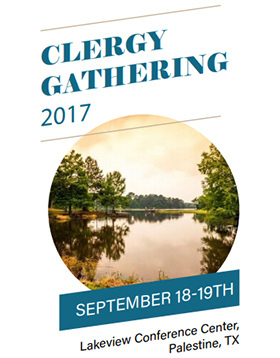 The Clergy Gathering is a special time for renewal, relaxation and conversation with your peers. All clergy persons are invited to attend—this includes provisional and ordained elders, provisional and ordained deacons, associate members, and part or full time local pastors. For 2017, The Gathering will be Monday – Tuesday, September 18 – 19 at Lakeview (only one night). Our speakers this year will be Dr. Michael Slaughter of Tipp City, Ohio, and our resident Bishop, Scott J. Jones. For additional questions, please contact Ivana Wilson at iwilson@txcumc.org.